This is where it all started for me back in 1986. 24 years latter I am still hooked and my nick name, Rad Dad came from this movie. Thanks for posting the movie! I can't believe I'd never seen it before in all these years. 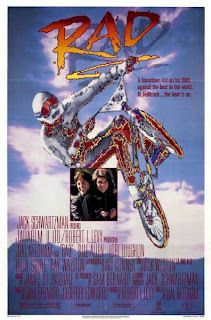 I have seen this movie,tons of times and it never get`s old,I can even speak almost all of the actors parts.My favorite parts are.The flatland intro "riding in the fog seems cool",flatland part in the gym,Hell Track Qualifiers and The Final race "there`s something about the phrase "Oh my heart ... a back flip" that puts a smile on my face".You got to admit,riding in a Kix cereal bowl is pretty Rad! Rad,Trend demo Tape,GT tapes,Freestylin` USA and Clowns Full of Hate were what I had on hand for inspiration. I remember seeing this in the Theatre with my friend Stewart Aragon...After the movie we went 2 a house party, and did tricks on our bikes...Cru Jones style!! !